The past week was pretty difficult for Richard and I. While we were excited to go home from our NICU stay after Colten’s myelomeningocele repair, we left feeling like our boy wasn’t doing so well and that the boy we brought to Mott Children’s Hospital wasn’t really the same boy we were taking home. 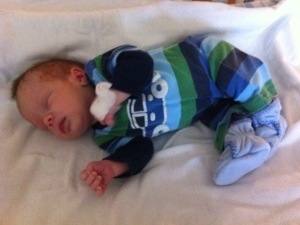 The first couple days of his life he had an alertness about him and we could make and hold eye contact with him. Then gradually after his first surgery his gaze became hazy and we felt as if he was just looking around but not really at anything. His eyes were very bulgy and making quality eye contact just seemed almost impossible. Richard kept saying “That’s not my son. 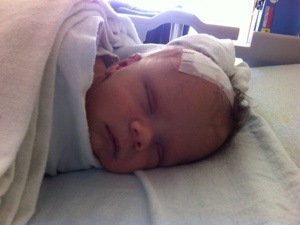 He’s not in there.” We knew this was from the hydrocephalus and have a lot of hope that there is no permanent damage. We asked the neurosurgeons about all these things and they reassured us that the infant brain would be okay and could withstand this amount of fluid without damage. Which is why they waited until yesterday to implant his shunt. We hope they’re right! Just since yesterday’s surgery, it is reassuring to me that Colten’s head already looks and feels better, although it’s still measuring 39.5cm around the skull bones. This will take time to reshape and go down but it’s a slower process than just draining the fluid. His soft spots are not as taut as they were – much squishier now – that’s a good thing. His eyes open more naturally, not bulging out. He’s nursing more confidently now as well which is promising, even if he’s super tired and not over-eating like he was the past week! And we’ve made more quality eye contact and I’ve seen less gazing off into never-never-land. He still has a ways to go in terms of recovery, but we are busting out of this joint and heading home NOW! This entry was tagged Chiari II, hydrocephalus, shunt, Surgery. Bookmark the permalink. My heart goes out to you as parents. I can only imagine your highs and lows. 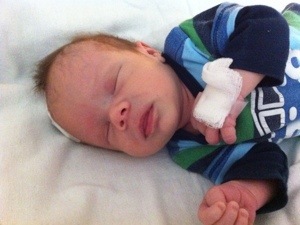 Colten is in good hands with you as parents and with the outstanding doctors and staff at Mott’s. Have faith that God will give you the strength to get through the difficult times. Many happy days await you with your boys! Glad to hear you’re “busting out”. Though this journey is necessary and difficult for you all, I take comfort that Colten has parents who not only love him dearly, but who are very aware of things to watch for and who are learning to take one day at a time. He is lucky to have you and I am glad you have great support groups, both in and out of the hospital.